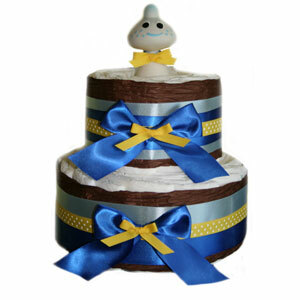 Our Organic 2 Tier Yellow Polka Dot Diaper Cake is a great gift for a parent awaiting a baby boy. Decorated with beautiful tones of elegant blue and bright yellow polka dot ribbon, this diaper cake will be a delight to look at. Bring along with you to the hospital as a "welcome baby" gift, or use it for a baby shower centerpiece. This practical new baby gift will be one of a kind.